President Donald Trump (L) gives a thumbs up to the media as he is greeted by Prime Minister of Canada Justin Trudeau during the G7 official welcome at Le Manoir Richelieu on day one of the G7 meeting on June 8, 2018 in Quebec City, Canada. 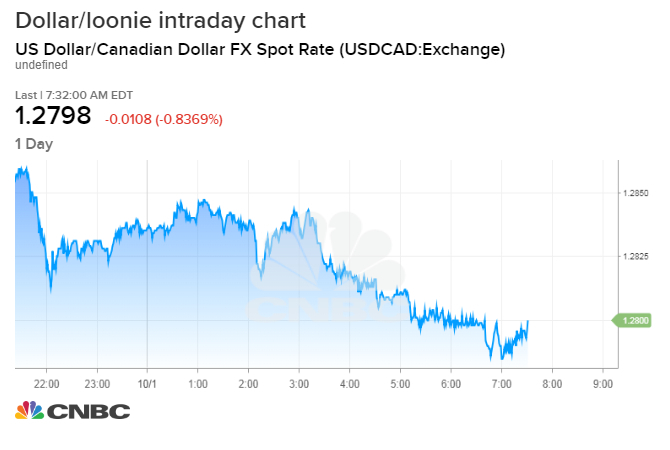 Canada’s dollar surged against its U.S. counterpart on Monday after the U.S. and Canada reached a trade deal to replace the existing North American Free Trade Agreement. The loonie rose 0.8 percent to 1.2799 per U.S. dollar. That was a four-month high for the CAD and a four-month low for the dollar vs the Canadian currency. The new deal is expected to be named the United States-Mexico-Canada Agreement, or “USMCA” for short, a senior U.S. administration official said Sunday. The new deal replaces NAFTA, a deal highly criticized by U.S. President Donald Trump. The agreement will deliver more market access to U.S. dairy farmers, while Canada will effectively cap automobile exports to the U.S. Both nations, along with Mexico – which agreed to a deal earlier this year – are expected to sign the agreement by the end of November. It would then be sent to Congress for a vote. Both countries were at an impasse last week, with U.S. Trade Representative Robert Lighthizer saying the United States was ready to move forward without Canada. Trump also criticized Canada for the slow pace of the trade discussions. Mexico’s currency, the peso, also jumped 1 percent to 18.54 per U.S. dollar on the news. Investors in U.S. stocks also cheered the deal, sending stock futures sharply higher.